I’m a stone cold maniac when it comes to making to-do lists. The only problem with my lists is that they’re usually filled with tasks that I’d much rather avoid. This week I’m going to put together a different type of list for myself. Instead of a To-Do List, I’m going to try out a Want To-Do List. -Sit in the sun with a book. Read the book. Take legs color from blindingly white to less blindingly white. -Make a birthday cake. Lick the batter and frosting bowl clean. -Drive to Sonoma to teach a baking class at Ramekins. -Go for a hefty hike in Echo Park. Make sure your thighs know who’s boss. -Make these pancakes for dinner. Include bacon. Invite cute boy with red hair. All signs point to this being a great week. What’s on your Want To-Do List this week? Let’s talk about these pancakes. They’re a sneak attack. Super simple. Unassuming. Then… delicious! It’s the cornmeal combined with the molasses. Brilliant. 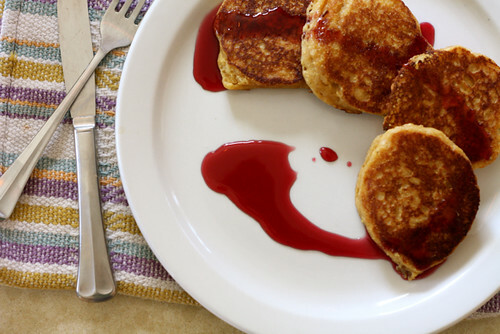 The cornmeal gives the pancakes body, an irresistibly hearty flavor and just a hint of crunch. The molasses takes these puppies to the next level. Warm and rich, sweet and slightly bitter. Just lovely. I paired these pancakes with a blackberryberry syrup. The bottled kind… like this little gem. If you can’t get a hold of cornmeal. If you’re not all that fond of molasses… rest easy. 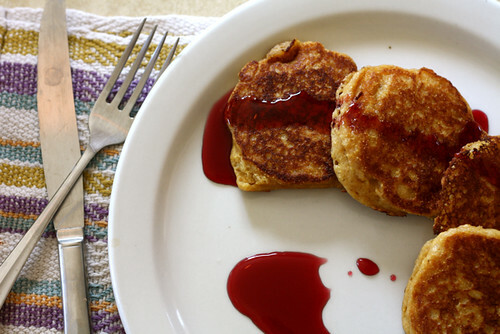 You might like these Oatmeal Cookie Pancakes or these Vegan Jam Swirl Pancakes. Yea… I got you covered. In a small bowl whisk together egg, buttermilk, molasses, vanilla extract and butter. Set aside. Add the cornmeal and stir until just mixed. The batter may be a bit lumpy. That’s ok.
Drop 2 Tablespoonsful of batter onto a hot, greased griddle or cast iron skillet. Flip when browned and cook through. Place on an oven proof plate in a 200 degree F oven to keep pancakes warm while you cook the rest of the batter. Serve with maple syrup, molasses or blackberry syrup. Happy Day! I hope the “cute boy with red hair” says yes to the invite. Have fun. I tend to get around to the things I want to do without a list, but if I had to make one I would add practice violin to the list. I get cello practice in everyday, but I’m slacking when it comes to violin. Aww those pancakes look so delicious! I want I want! Sit in the sunshine somewhere far away and go brown (my friend jst came back from Miami and I am very envious of her bronzed glow). Read the latest Vikram Seth book but I hear its not out til abt 2013…its ok, I can wait. They look good! I have the same kind of molasses as you do even though I am in England and it was imported! Have been obsessing about molasses and spicy things. Don’t think we can get boysenberry syrup here. Will have to try maple or maybe just some fruity jam. Love pancakes with bacon. Have you seen the recipes out there for gingerbread pancakes? Homesick Texan has one on her website. I just got off of a 5 day juice fast! Instead of writing “to-do lists” I’m expanding my writing of “to-eat” lists. These very pancakes are now high on the list! my to-do list: lose more weight!! On my want to do list–nothing. As in doing nothing, for a whole day. But that seems highly unlikely, so I’ll go with wanting to learn how to shoot in aperture priority on my camera. It’s gray and gloomy out, so why not study up? And I want those pancakes with that syrup. No other will do! nice! 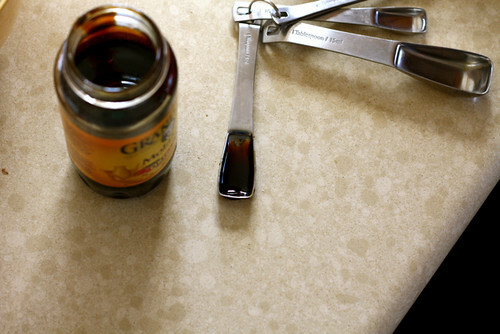 ive got a whole bottle of molasses ive been trying to put to good use. i love the fun to-do list. ive been trying to become a list person & i think your want to-do list will be the perfect way to get me going! 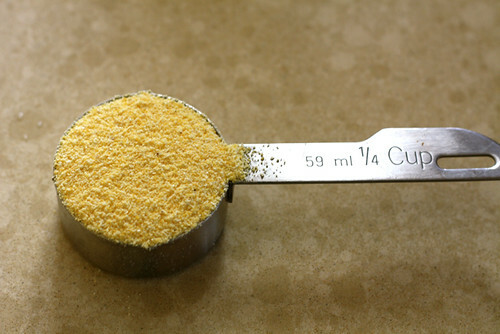 I love the idea of using cornmeal! So smart. These look fabulous. Good luck with red-haired boy! These sound so unique! I have never had anything quite like this. I love corn bread, so I am sure I would love cornmeal pancakes. As for that want-to-do list, it will definitely include these pancakes. And maybe some bright red freshly polished toenails. But not at the same time, because that could get messy. Well, it’s almoste Easter so I have lots to do: bake some muffins for my friends at yoga, and maybe a focaccia too, then I’m sure my father will complain that he has nothing to eat for breakfast, so I’ll have to bake something else, and then there’s Easter lunch with the whole family, and my goddaughter needs a special cake without butter, otherwise how can she have some dessert? So That’s my to do list: bake, bake and bake. Any ideas about the special cake?